Our designed baskets are arranged so you can enjoy Maui Protearegistered.gif both fresh and as it gradually dries. These tasteful Maui Protea arrangements will last 1 – 2 weeks fresh, then over the next few weeks will transform into beautiful dried flowers! All prices include FedEx SHIPPING which takes 2 days. Maui Protea are expertly packed for safe arrival and shipped from Maui – just take the basket out of the box and place on your favorite table. Care instructions and flower preservative are included in every order of Maui Protea. Keiki Arrangement A beautiful arrangement of Maui Protea and Tropical Flowers perfect for a table top arrangement. $89. Kuu’ipo A beautiful upright arrangement of Maui Protea and Tropical Flowers. Container varies. Approx 24″ tall $109. Large Protea/Tropical Mix A beautiful upright arrangement of Maui Protea and Tropical Flowers. Approx 30″ tall. $139. Tropical Coco Weave A 14″ diameter basket filled withMaui Protea and Tropical Flowers. $125. Yukiko 1 King with 8 assorted Maui Protea artfully designed in a low container. This arrangement will bring elegance to any setting. Special online price $95. 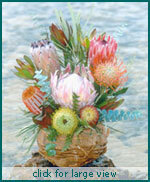 Premier Coco Fiber Basket Our top of the line Maui Protea arrangement is always guaranteed to thrill the recipient! Our coconut fiber basket is filled with approximately 20 flowers and measures 17″ high and 16″ in diameter. The basket is available in off white or natural brown. Please specify color in the comments section. $185. Coco Weave Basket This basket combines woven lauhala leaves and coconut fiber for a real Hawaiian feeling. A natural brown color, it contains 9 Maui Protea flowers and is 11″ high. $109. Kohala Basket Our smallest basket freshly woven from coconut palm fronds. A perfect thank you gift or room accent. Filled with 7 Maui Protea flowers it measures 9″ high. Special online price $90.